Tabletop RPGs are all about imagination, so anything that adds to the ambience can really help to make a game come alive. Using music has long been a favorite trick of games masters the world over, but it's not as easy as sticking on the soundtrack to the Lord of the Rings movies and calling it a day. In Issue 298 of The Escapist, Will Hindmarch offers tips on choosing the right music for your game, and more importantly, how to use it. Whether you're exploring epic realms with Dungeons & Dragons or pursuing the horrific unknown with Trail of Cthulhu, whether you're a new Gamemaster or a honed expert, you probably spend a fair amount of time describing what the players' characters see and hear. But what about what the players themselves hear? What about the soundtrack to your RPG campaign? If you want a more cinematic experience when running your favorite RPG, do what movies and videogames have been doing for years: Use music to add a new dramatic dimension to the scene. Music can heighten the theatricality and deepen the immersion in a storytelling game like an RPG. It saves you time and provides an undercurrent of atmosphere even when your game temporarily devolves into in-jokes or rules debates. It works like the music in your favorite movie or videogame, except the music is never (or almost never) composed specifically for the game you're playing. 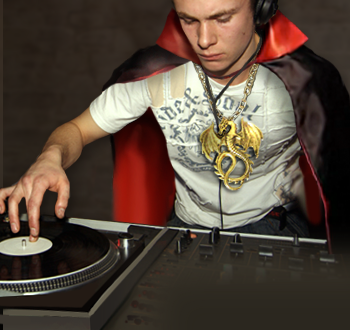 To select and play the right tracks to give your game new ambiance and attitude, you, the DM, must also become you, the DJ. Used properly, music can add atmosphere and tension, can build tension, and even spur players on to action. You can read more about it in Hindmarch's article, "The DM is a DJ."